Nashville, TN – Multi-platinum-selling global superstar Carrie Underwood released the track listing and songwriters for her upcoming studio album, Cry Pretty, available on September 14. Her first time officially in the Producer chair, Underwood co-produced Cry Pretty alongside David Garcia and she co-wrote nine of the songs featured on the album making it one of her most personal albums to date. Underwood wrote the title track and lead single, “Cry Pretty,” with Hillary Lindsey, Lori McKenna and Liz Rose (The Love Junkies). Underwood, exposing pure, raw emotion earned critical praise for her powerful debut performance of “Cry Pretty” at the Academy of Country Music Awards in Las Vegas. 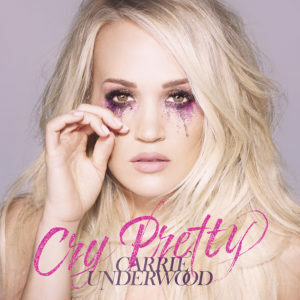 Cry Pretty includes a bonus track also co-written by Underwood featuring Ludacris, “The Champion” which opened NBC’s Super Bowl LII and was incorporated into the 2018 Olympic Winter Games coverage earlier this year. In Spring 2019, Underwood will launch a new arena tour, The Cry Pretty Tour 360. Sponsored by CALIA, the new tour will kick off on May 1 in Greensboro, NC, and will play 55 arenas across the U.S. and Canada and be promoted by AEG Presents. She will be joined on tour by special guests Maddie & Tae and Runaway June.